Printing is available for $0.10 per copy.﻿﻿ Wireless printing available. Can't find something you want? We can get it for you from another library! $2 fee. You can also get a library card at most libraries in Iowa for free! Cost is $1 per page. Need a meeting room or the ICN room? Click here to start the process to request one of our spaces. 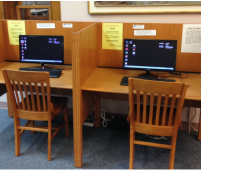 The Library staff are available to help with test proctoring. Please contact the Library before you need a test proctored. Can't make it into the library due to health or mobility issues? Not a problem. We can bring books to you.